Club Med’s newly opened 433-room Belek resort will use its proximity to one of the Mediterranean’s top golf courses, Lykia Links, and the beauty of the Turquoise Coast to attract families and other travelers. The Club Med Belek is home to Lykia Links, ranked the top Turkish golf course by Golf World in 2012. It also features a 550-seat amphitheater, a range of Children's Clubs and such activities as the flying trapeze and archery. Belek also features an aquatic park with waterslides and more. The Lykia Links golf course is just one of 300 courses in the world earning the “Links Course” status. The course Lykia Links is on-site as are a driving range, two putting greens, a clubhouse, pro shop and golf school. Lessons at the Golf School are included in the all-inclusive package, and guests can purchase greens fee packages at an extra cost. Guests can also take lessons at the year-round Tennis School, challenge themselves to windsurfing or sailing. Each room has a balcony or terrace, and 16 two-bedroom villas complete with both an indoor and outdoor pool, sauna and butler service. 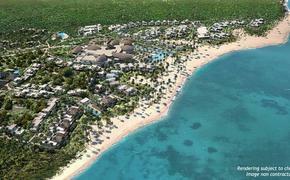 The resort has eight pools and four restaurants or bars as well as the Club Med Spa by CARITA.